Aerolineas Argentinas is focusing on further expansion in the short-haul market, where it continues to benefit from protectionism. The government-owned carrier has committed to purchasing 20 additional 737-800s, growing a narrowbody fleet which has already been renewed since renationalisation in 2008. The flag carrier has incurred stiff losses since renationalisation despite trying to improve its position through network adjustments, fleet renewal and new partnerships including membership of SkyTeam. Aerolineas continues to work on improving its highly unprofitable long-haul operation but the carrier is now primarily focusing growth in the domestic and – to a lesser extent – the regional international sectors. Domestically Aerolineas benefits from a lack of competition as Argentina is not open to new entrants including low-cost carriers. Its only main domestic competitor, LAN Argentina, has been unable to expand and has had to overcome numerous challenges, including a recent attempt to evict the carrier from its maintenance base which could have forced it to withdraw from the domestic market. Aerolineas signed on 21-Oct-2013 an agreement with Boeing to order 20 737-800s. The carrier already operates 26 737NGs, including 20 737-700s and six 737-800s, and is also committed to leasing six additional 737-800s from Air Lease, according to the CAPA Fleet Database. The 26 additional 737-800s will enable Aerolineas to pursue more domestic and regional international growth, in line with its business plan. The domestic expansion is in response to rising domestic demand and is enabled by Aerolineas’ strong position in the domestic market, where there is a lack of competition. Aerolineas currently accounts for about two-thirds of total capacity in Argentina’s domestic market, according to CAPA and Innovata data. 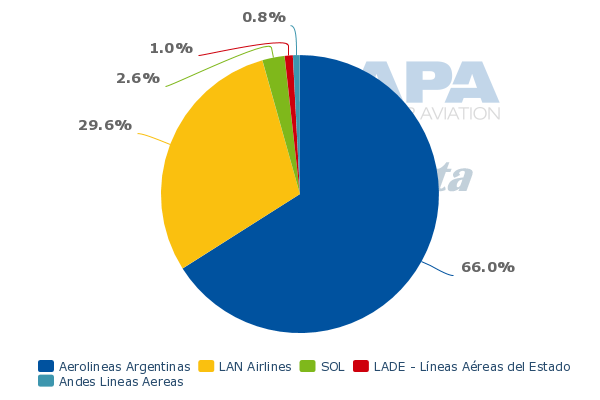 LAN Argentina accounts for about 30% and small regional carriers account for the remaining 4% to 5%. Aerolineas and LAN are the only competitors on trunk routes. According to CAPA and Innovata data, Aerolineas will offer about 168,000 weekly domestic seats in the first week of Nov-2013. This represents about a 20% increase compared to the same week in Nov-2012 and a doubling of capacity compared to the same week in Nov-2011. Over the same time period, LAN Argentina’s domestic capacity has been flat. The carrier currently offers about 73,000 weekly domestic seats. For 2Q2013, LAN Argentina parent LATAM reported only 3% ASK growth for its domestic Argentinean operation. Through the first eight months of 2013 domestic passenger traffic in Argentina was up 14% compared to 2012 to 9.4 million, according to data from airport operator Aeropuertos Argentinas 2000. In 2012, domestic passenger traffic in Argentina was up 16% for the full year to 13 million. Aerolineas has likely been the driver of the increases in 2012 and again in 2013 as LAN Argentina capacity levels have been flat. Aerolineas’ management team told CAPA earlier this year that conditions remain more favourable in the domestic market compared to the more competitive international market. The group, which includes regional subsidiary Austral, initially projected 40% year-over-year domestic passenger growth for 2013. In comparison international passenger traffic was projected to grow by only 9% this year. It seems unlikely Aerolineas will achieve the 40% figure but domestic growth of at least 20% and potentially 25% is likely for the full year. Aerolineas expects similar ratios tilted heavily in favour of domestic growth over the next few years. The group already allocates almost 50% of its seat capacity to the domestic market. The opportunity to expand domestically comes as Argentina’s domestic market has traditionally been under served. Argentina is a geographically large and diverse country, requiring air travel to avoid long road or train journeys. But Argentina’s domestic market is about the same size as neighbouring Chile, which has less than half the population, and is smaller than South Africa, Vietnam and Saudi Arabia. Argentina is one of only a few domestic markets among the world’s top 30 not yet served by an LCC. The market is clearly large enough to support an LCC but the government will not approve any new entrants for domestic trunk routes. LAN Argentina launched services in 2005 during a period in which Aerolineas Argentinas was still under private foreign ownership and was languishing. The government at the time was concerned that Aerolineas was not adequately serving the local market and was not happy with Aerolineas’ operation and reliability. It therefore allowed LAN, which had been eyeing the Argentinean market for some time, to enter. If Aerolineas had never been privatised, there would have never been a window for LAN. LAN has continued to operate since Aerolineas was renationalised in late 2008 but it has come under threat multiple times and has not been able to expand. The latest and more serious threat came in Aug-2013 when LAN Argentina received a notice to vacate its hangar at Buenos Aires Aeroparque, its domestic hub, within 10 days. LAN parent LATAM immediately lashed out, calling the notice “not an isolated event but rather a measure that would be in line with an increasing level of action against our company, in order to harm our operations in Argentina”. LAN Argentina was able to secure in late Aug-2013 a court injunction blocking the implementation of the eviction notice, which the carrier saw as illegitimate as it had a contract with the airport’s operator to continue leasing the maintenance hangar until 2023. The carrier had said that without the hangar it would be unable to retain its domestic operation, which is entirely based at Aeroparque. LATAM has since blamed Aerolineas, claiming its rival has been seeking to eliminate competition, and has said the Argentinean Government continues to be supportive. Aerolineas CEO Mariano Recalde has repeatedly complained of an unlevel playing field on the basis that LAN Argentina only competes on profitable trunk routes, which leaves only Aerolineas to operate on unprofitable regional routes. He also has pointed out that other countries do not allow foreign-controlled companies to operate domestic flights. Aerolineas currently serves 34 airports in Argentina while LAN serves 12, according to Innovata data. LAN Argentina has a fleet of 11 A320s and two 767s, according to the CAPA Fleet Database. While the A320s are based at Aeroparque, the 767s are based at Buenos Aires’ international airport, Ezeiza, and used mainly to serve Miami. The Argentinean market would benefit from more private competition and should be opened up to more carriers, including LCCs. But the current duopoly is unlikely to be broken under the current government and while LAN Argentina has survived the latest challenge the carrier is unlikely to pursue growth given the uncertain environment. Aerolineas sees an opportunity to continue growing its domestic market share. While fares for the local population are kept at reasonable levels, the carrier’s domestic expansion plan is only made possible by the lack of competition. Aerolineas has already renewed and expanded its domestic fleet as part of the restructuring initiative which began after re-nationalisation. Under prior Spanish owner Marsans, Aerolineas’ narrowbody fleet consisted of ageing 737-200s, 737-500s and MD-80s. The last 737-500 and MD-80 were phased out in Apr-2012, leaving the group with a modern narrowbody fleet of 737NGs and Embraer E190s. Austral currently operates 21 E190s while Aerolineas mainline operates the 22 737-700 and four 737-800s. An initial batch of 20 E190s were ordered in 2009 and delivered new to Austral in 2010 and 2011. Austral ordered two more E190s earlier this year, with one already delivered and the second slated for delivery within the next few weeks, giving the carrier a fleet of 22 E190s by the end of 2013. Two of Aerolineas’ 737-700s were purchased from Boeing in 2009 while the other 20 737-700s were leased second-hand and are now between six and 13 years old, according to the CAPA Fleet Database. The four 737-800s were acquired more recently, in late 2011 and 2012, with two being leased new and two being leased as 10-year old aircraft. The six additional 737-800s from Air Lease are slated to be delivered between late 2014 and early 2016, according to Air Lease’s Apr-2013 announcement of the deal. The 20 additional 737-800s ordered directly from Boeing are expected to be delivered by the end of 2017. Aerolineas likely negotiated a good deal on the 20 aircraft as they come at the end of the production line before Boeing switches over to the re-engined 737 MAX, which Aerolineas has not yet ordered. CAPA reported in late 2012 that the group’s fleet plan envisioned 60 narrowbody aircraft by the end of 2016, including 22 E190s and 38 737NGs. The new order will drive even faster narrowbody growth, with a fleet of up to 74 narrowbodies including 52 737NGs and 22 E190s. Mr Recalde told CAPA in Jun-2013 that the domestic and narrowbody focus from the five-year business plan that was implemented at the beginning of 2010 will continue. While Aerolineas also has been working on improvements to its long-haul operation most of the carrier’s growth over the next few years will again be directed to the short-haul market. The only major exception is New York, which is being launched with a daily flight in Dec-2013. Aerolineas suspended service to New York in 2008 and a resumption of the route has been part of the five-year plan since 2010 but could not previously be implemented due to lack of widebody aircraft. Aerolineas’ widebody fleet has consisted in recent years of 11 A340s. The carrier recently placed into service its first A330-200 and plans to have four A330-200s in its fleet by the end of 2013. The new type will allow the carrier to phase out some of its A340s. A330-200s initially will be used to Miami, which is Aerolineas’ biggest international market with two daily flights, and to New York. As CAPA previously reported, the replacement of inefficient A340s with A330s is a critical and a severely delayed component of the carrier’s on-going restructuring. With the exception of New York, the business plan for the long-haul operation calls for only modest expansion and to focus on offering a more competitive in-flight product and a more consistent service. The former is being achieved by renewing the fleet and the latter by offering more frequencies across its long-haul network as part of a plan to eventually upgrade all its long-haul routes to daily with the exception of Cancun, which is a seasonal low frequency leisure route. Aerolineas currently serves Miami with two daily flights and Madrid with one daily flight. Its other long-haul destinations are less than daily, including Barcelona (five weekly), Rome (four weekly), Sydney (four weekly), Bogota (four weekly) and Caracas (five weekly). Mr Recalde expects Rome to initially be increased to five weekly frequencies and Barcelona to be increased to six weekly frequencies. In addition to taking four A330-200s, Aerolineas is taking two A340s in 2H2013, one of which was recently delivered. While Aerolineas currently has 12 A340s according to the CAPA Fleet Database this is likely temporary as the carrier has been intending to use the two newly acquired A340s to replace older A340s. This is in line with the carrier’s plan to have a more competitive and standard harmonised in-flight product across its widebody fleet. Aerolineas has retrofitted the A340s it is retaining. The carrier is likely to continue operating eight or nine A340s alongside the four A330-200s until it decides on the next phase of its widebody fleet renewal programme. Meanwhile the carrier’s regional international network is expanding with a focus on Brazil, which is its largest market accounting for about 28% of its international seat capacity. Aerolineas recently firmed up plans to launch Curitiba as its eighth destination in Brazil. The carrier originally aimed to begin Curitiba service in Oct-2013 but is now planning to start daily Buenos Aires Ezeiza-Curitiba service on 1-Mar-2014 using Austral-operated E190s. Aerolineas began serving Belo Horizonte and Brasilia from Ezeiza earlier this year. It also serves Rio de Janeiro and Sao Paulo from both Ezeiza and Aeroparque, which re-opened to regional international services in early 2010, and serves Porto Alegre from Aeroparque. Seasonal low frequency service is currently operated to two other Brazilian destinations, Florianopolis and Salvador. 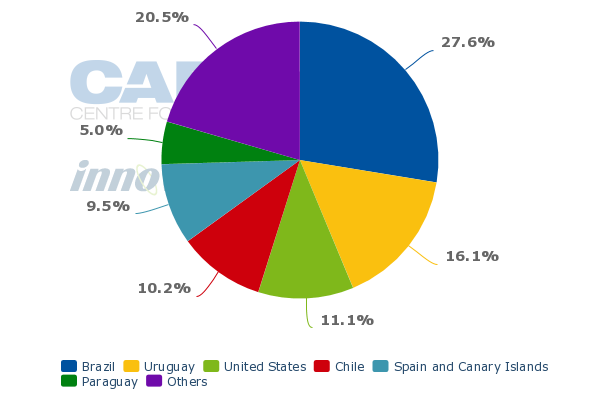 Aerolineas will have over 11,000 weekly one-way seats to Brazil in Dec-2013, an increase of almost 40% compared to Dec-2012 levels, according to CAPA and Innovata data. Aerolineas’ regional international network also includes Montevideo in Uruguay, Santiago in Chile, Santa Cruz in Bolivia and Lima in Peru. Montevideo is served from both Buenos Aires airports while Santiago is served only from Aeroparque and Santa Cruz and Lima are served only from Ezeiza. Aerolineas in 2012 resumed service at Ezeiza to major domestic destinations and some regional international destinations after initially moving all short-haul operations to Aeroparque in early 2010. The resumption at Ezeiza was designed to improve connections and bolster the profitability of its long-haul network. About 35% of Aerolineas’ international traffic now connects at Ezeiza to other domestic or regional international destinations. Having some short-haul feed also benefits SkyTeam partners. Aerolineas joined SkyTeam in Aug-2012 and has since been working on implementing codeshares with several members. Mr Recalde says Aerolineas has benefitted from SkyTeam membership internally, as joining the alliance has raised the carrier’s standards and confidence, and has provided added value to its customers. But SkyTeam has not improved the carrier’s profitability and its long-haul network in particular continues to bleed. Nearly five years of restructuring have yielded improvement to the carrier’s bottom line but the carrier is still far from break-even. Targets for returning to profitability have repeatedly been missed. Mr Recalde acknowledged in an interview with CAPA earlier this year that the plan to achieve profitability in 2013 was no longer possible and the carrier was projecting it would incur a USD250 million loss in 2013 on revenues of USD2 billion. The carrier incurred a net loss of USD500 million in 2012 on revenues of USD1.6 billion, bringing accumulated losses to about USD2 billion since renationalisation. Under government ownership Aerolineas has been able to more than double its annual revenue stream from USD820 million in 2009. The group’s annual passenger traffic has also more than doubled over this period and is expected to end 2013 at 8.4 million. Aerolineas aims to again nearly double passenger traffic over the next four years and reach 14 million in 2017, at which point the carrier will have placed into service the 20 newly ordered 737-800s. The domestic expansion and transition to more efficient A330s on several of its long-haul routes should further improve profitability. But achieving profits will remain a challenge even with the carrier protected from competition. In addition to a lack of competition in the domestic market, Aerolineas has benefitted from a restrictive policy limiting international expansion by foreign carriers at secondary cities. Aerolineas has come a long way since re-nationalisation and the new narrowbody order further signals its intention to grow and have a modern and reliable operation with a respectable product and high standards. Aerolineas is not yet profitable but it is now better positioned to compete. With Aerolineas in an improved state it is time for the government to drop its protective policies and start opening up the market to the benefit of Argentina’s consumers.